Here's a list of fun Disney World dining experiences that may appeal to boys. 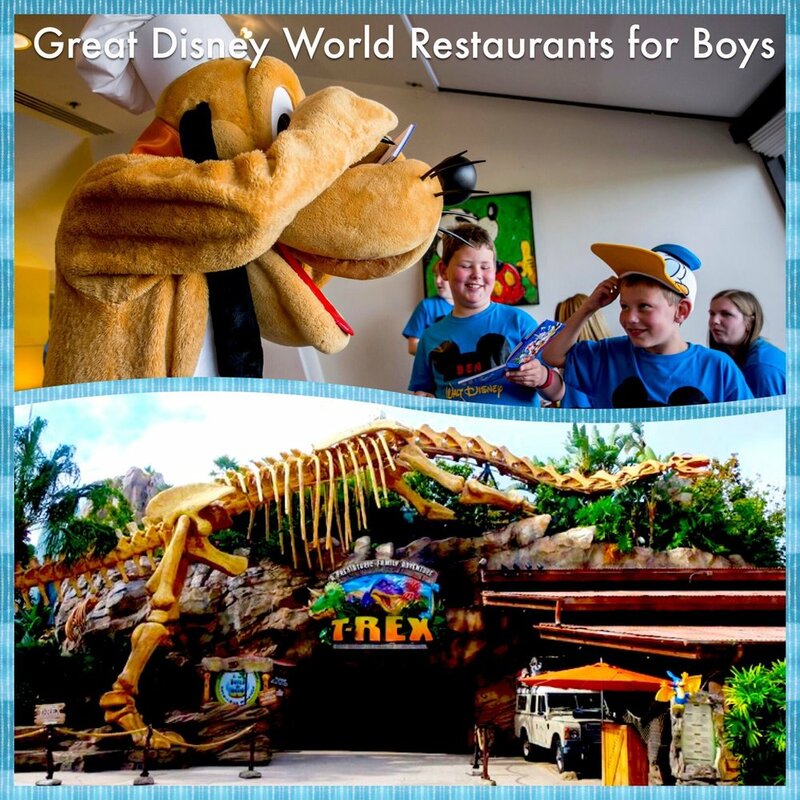 Great Disney World Restaurants and Dining Experiences for boys - includes character meals and fun dining locations. Abbreviations Key: B,L,D : These letters indicate which meals (Breakfast / Lunch / Dinner)are served at that location. All of the meals are included in the standard and deluxe dining plans; most only require a single table-service meal credit per person. Cinderella’s Royal Table, Hoop Dee Do Musical Revue, Spirit of Aloha Luau and Mickey’s Backyard Barbecue are all signature dining locations that require two table-service credits per person, age 3 or older. Teas, cruises, and other events do not participate in the dining plans. Note: Be Our Guest is the only quick-service location that accepts advance reservation. Reservations strongly recommended because of the popularity of the location. A nice time-saving feature of Be Our Guest is that you can pre-order your breakfast or lunch options - click here for more information. Coral Reef (L, D) – no characters but the restaurant looks into the aquarium full of beautiful live fish. San Angel / Mexico pavilion (L,D) – Mexican village, no characters. 50’s Prime Time Café (L, D) Sassy waitresses, diner food – fun. Sci-Fi Dine Inn (L, D) Looks like a classic drive-in theater. Hollywood & Vine (B, L) – little boys, Playhouse Disney characters like Jake of Neverland pirates, Doc McStuffins, Sofia the First, etc. (D) Dinner’s theme changes seasonally but typically includes classic Disney characters like Mickey Mouse, Goofy, and Donald & Daisy Duck. Tusker House (B,L,D) – Classic Disney characters: Donald, Daisy, Goofy & Mickey. Rainforest Café - no Disney characters but fun jungle-like setting with animal animatronics. T-Rex - similar to Rainforest Cafe but Dinosaur themed. Planet Hollywood - no characters but a fun setting. Splitzville - Super-cool bowling alley with food. Cape May Character Breakfast – features Goofy, Minnie and Donald. Nice option for guests in the Epcot resort area or guests who have a car. Difficult to get to using Disney transportation; recommend use of a taxi and then they can take Disney Transportation to a park. Chef Mickey (B, D) – Classic Disney Characters: Mickey, Minnie, Chip, Dale, Goofy. Noisy. Pirates & Pals Fireworks Voyage (Contemporary resort) – Not a character meal but a spread of party snacks is available prior to boarding a boat to watch the Magic Kingdom fireworks. Neat experience featuring Captain Hook & Mr. Smee. Not included in Disney Dining Plans. Advance reservations required - Event for the whole family. Supercalifragilistic Breakfast at 1900 Park Fare features Mary Poppins, Alice of Wonderland, and the Mad Hatter, Pooh and Tigger. Wonderland Tea Party at 1900 Park Fare – 1 hour event for childrenages 4 – 12; parents are welcome to stay and observe but do not participate. Alice and Mad Hatter appear; children hear stories, decorate their own cupcakes, and enjoy heart shaped peanut butter & jelly sandwiches, chocolate dipped rice crispy squares, and apple juice. at 1:30PM. Reservations required & may be booked 90 days prior to event. Cost: approximately $42 per guest. This location is not included in the Disney Dining plans. Mickey’s Backyard BBQ – Dinner only, select nights of the week – weather permitting / 2 dining plan table-service credits per person. . Fixed menu served on picnic tables in an open air pavilion. Different from typical character meals – there is a live country-western band and a dance floor where Mickey, Minnie, Goofy, and Chip ‘N Dale lead line dancing. You can still get photos & autographs with the characters. Hoop Dee Doo Musical Revue – Fun 2-hour western musical dinner show with corny jokes and a slightly vaudeville feel. Set menu served family style. No Disney characters but a spirited cast of performers. Disney Dining Plan Signature Dining Experience – 2 table service credits per person. Click here for a review. Campfire Sing-Along with Chip & Dale - Nightly, weather permitting / Free Event. This is not a meal but you can purchase snacks at the chuckwagon. There are usually 2 lit campfires where guests can roast marshmallows; s’mores kits available for purchase. Not a Disney Dining Plan event. Click here form more information. Ohana (B,D) – Lilo, Stitch, Pluto & Mickey at breakfast, no characters at dinner but fun experience. Spirit of Aloha Dinner Show - Luau with Polynesian dancing and an all-you-care-to-enjoy family-style meal. Disney Dining Plan Signature Dining Experience – 2 table service credits per person. Whispering Canyon (B,L,D) – fun, noisy experience with sassy servers; no characters. Children’s Pirate Cruises – Disney offers 4 pirate themed cruises for children ages 4 – 12 years old. The cruises depart from Disney’s Grand Floridian, Caribbean Beach, Yacht Club, and Port Orleans Riverside Resorts thought you don’t have to be a guest of those resorts to participate. Advance reservations are required and can only be booked by phone. Prices and times subject to change. Call Disney Dining for more information.